brown bread ice cream: I Invented Something! Do you know I could have invented the braid? That's not what this post is about, but I thought it'd be a good intro that would reveal the extent of my ingenuity. Oh sure, I might not have been the first person to ever braid hair, but when I was really young and had never seen a braid before in my life, I was futzing with my doll's hair and I did something to it that looked really nice. I was so excited, I showed my mom, who of course was totally unimpressed, "Great, honey, you braided your doll's hair." Okay, so I'm almost 100% certain I did not invent this thing that I came up with yesterday. Maybe every home baker already knows about this the way a freediver knows holding one's breath underwater is a good idea. But considering how many times I've read the instructions "Butter and flour a pan," I just KNOW there are others out there who could benefit from this gem of a non-discovery that I made yesterday, while baking fruitcake (anyone feeling I might be a bit late in my fruitcake making, there's an explanation here). First, an announcement...ahem: You don't have to bloody butter and flour your loaf pan anymore! Or use Pam, if that's your poison of choice. But yesterday, I honestly don't know where this inspiration came from (probably some cooking show I saw ages ago and had stored in my subconscious until a much later date, when I could then claim credit for somebody else's idea--okay, to be fair, it's not like I'm trying to get a patent or anything. And I'm sharing this freely with all of you, aren't I? 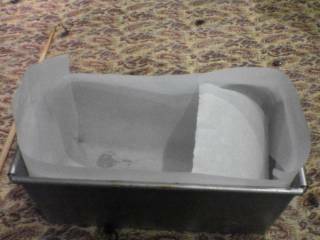 ), I was fiddling with the parchment paper, trying to think of a neat way to line my loaf pan. 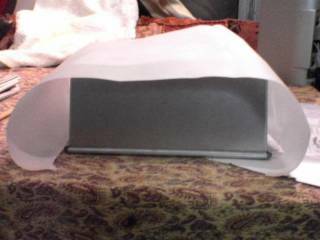 Recently, I'd been folding the paper to fit just the bottom, so if I baked something sticky, I'd only have to saw away at the sides. But this technique still left something to be desired. 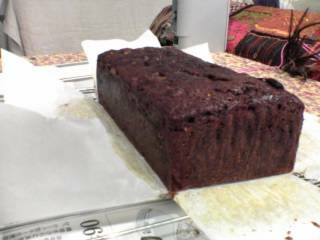 So I started cutting away with my scissors, and after a few botched attempts, I swear I heard trumpeting angels when I pushed the parchment paper into the loaf pan and it fitted...almost perfectly! No, it isn't perfect. 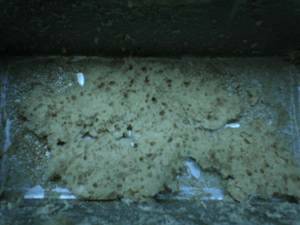 But I was totally satisfied with the results of my cake, which slid sleekly out of the pan and had gloriously unmarred sides and bottom. I don't know if it was because of the parchment lining, but I also noticed my cake rose much more evenly, without the usual huge dome on top. 1. You need a pair of scissors and parchment paper (pencil optional). 2. Set your loaf pan facedown. 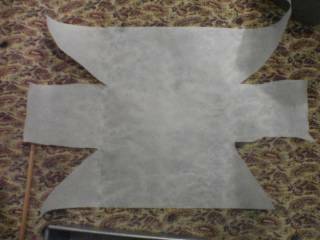 Tear yourself a piece of parchment paper large enough to cover all sides of the pan. 3. If you want to be precise, you can mark the four corners of the pan with a pencil, but I don't find it necessary. 4. Turn the pan so that one of the short ends is pointed toward you. 5. 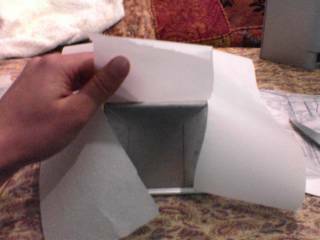 Making sure the paper is properly covering the pan, cut two parallel lines, one toward each corner of the pan. 8. Just tuck the triangular flaps around the center square flap, with the square flap on the inside. 9. That's it. It's really easy. 10. When the cake (or whatever) is cooled a bit, I just grasp the paper ends and pull the cake out of the pan. Hooray!! 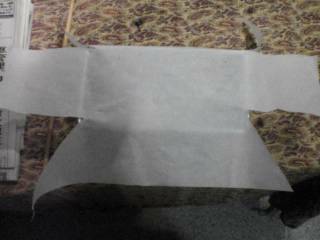 This is marvelous... how did you know the paper wouldn't burn? I am impressed that you came up with this yourself (like the braid). The Germans use this method too (but none of them came up with it on their own!!)... you can buy "Backpapier" all over here. It is so much more convenient than buttering and flouring. You are so right. You go, girl! Sorry to burst your bubble, but I think I've seen this on TV before. Then again, considering you weren't exposed to this before, it is quite a good idea! Thanks, Jessica! But I guess I shouldn't have been so proud of stumbling upon something less than novel. Also, parchment paper is often used for baking, so I can't claim any credit there either. I hope other people as clueless as me will benefit from this though! Hsin-Li, sigh, I suspected *my* paper-folding technique was pretty old news. I guess I mentioned the braid story, as I suspected a close parallel lay between my two "discoveries." Darn. I heart you! This is brilliant. I'm baking pumpkin bread right now. thank you for this timely solution, making fruitcake today and the recipe says bake in nonstick pans, which i don't have! but i do have parchment paper! Where were you when I made a nutmeg cake with rum sugar syrup tonight? :) I've never had a cake stick to the bottom. Totally ruined (although it tasted great). However... a lot of good that does me when I was going to take it to a party tomorrow. When I saw your picture...I couldn't believe it. I thought I was the only one with the problem...and was embarrassed to tell anyone I couldn't fit parchment paper in a pan.